and Living Well Loved Mrs. La'Shay S. Crayton. There will be a chance to purchase a book and you can also bring your pre-purchased books to be signed as well. You do not want to miss this engaging event. You will leave encouraged and blessed! Want to RSVP via Facebook - Please click here to rsvp! Please let us know if you can make it!! Really looking forward to seeing you there. Thank you in advance if you have already purchased a book. Thank you for your support! Thank you for your prayers and blessings. I pray the same back to you! Want to keep it basic and just RSVP below! RSVP below for the event. Please also stay connected by subscribing. We thank our amazing sponsors who have been helpful in allowing us at Living Well and Living Well Loved to continue the work of uplifting, educating and empowering! Would you like to become one of our sponsors. Please send us an email. Elma's: James Brown aka Jimmy is the passionate guy behind the Caribbean Soul eatery in Harlem with the extra surprise of the best natural juices and smoothies around. 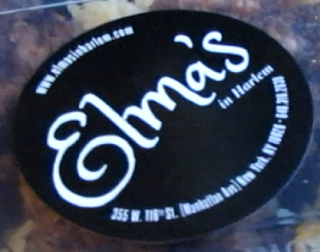 The owner named the shop after his granny "Elma", who believed in bringing people together through food and drinks. Jimmy keeps Elma's legacy alive through great food, conversation and par excellent customer service! Find out more at their page by clicking here.